Researchers at Sandia National Laboratories are grafting 1,300 new nodes onto their homegrown supercomputer cluster, known as Cplant. The lab paid $9.6 million for 1,300 Alpha DS10L nodes from Compaq Computer Corp. The 1.75-inch-high rackmount nodes, each with a single 466-MHz Alpha processor, all run the Linux open-source operating system, said Rolf Riesen, one of the lead Cplant software developers at the Energy Department's Albuquerque, N.M., facility. Researchers will install the 1,300 new nodes in a main cluster, to be known as Antarctica. The existing 580-node Cplant cluster known as Siberia will be split into two 256-node clusters, one on Sandia's restricted network and another on its secret network, leaving a few spare nodes. 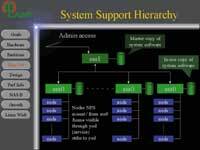 Cplant's system support hierarchy gives users a copy of the system software while retaining a master copy for administrative use. Scientists can attach either of the two smaller clusters to the 1,300-node cluster at a time, yielding a 1,556-node workhorse. 'We'll have the ability to swing the middle section back and forth' depending on a project's security level, Riesen said. The researchers are trying to make the Cplant cluster appear to users as much as possible like Sandia's largest computer, the Intel-based ASCI Red system. Red, the first supercomputer ever to perform more than 1 trillion floating-point operations per second, often has more requests for computing time than it can satisfy. But users will have to recompile their programs for Cplant because Red, part of Energy's Accelerated Strategic Computing Initiative, does not run Linux. Also, Cplant will never process as fast as an equivalent section of ASCI Red. The commodity interconnect joining the Cplant nodes, the Myrinet scalable interconnect system from Myricom Inc. of Arcadia, Calif., isn't as speedy as the dedicated fabric inside Red. Cplant scientists must use commodity networking hardware because of the project's mandate to build solely with off-the-shelf components. Homegrown supercomputers such as Cplant are commonly called Beowulf clusters, but Riesen said that term is correct only for special-purpose machines designed for a few users. Cplant is a general-purpose machine with batch scheduling to handle multiple jobs. Despite Sandia's hot New Mexico location, scientists named the Cplant clusters after Earth's cold regions because the Linux mascot is a penguin, Riesen said. Sandia public affairs officials said that Cplant may become the 20th fastest supercomputer in the world after the upgrade. Cplant now ranks 84th on the semiannual Web listing of the fastest computers at www.top500.org. The researchers, however, did not finish the necessary testing in time to submit Antarctica's performance statistics to the committee compiling the November supercomputing survey. Cplant will probably remain a work in progress for some time to come.